Steve Cowan (Performance) and Jason Noble (Composition) pay tribute to Newfoundland and its people in this graduate student research-creation project. Focusing on the province’s dialects and folksongs, they are using interviews with residents as source material for a new composition. Steve Cowan (D.Mus. program, Guitar Performance) and Jason Noble (Ph.D. program, Composition) grew up in Newfoundland and have a deep fondness for the province’s culture. This research-creation project pays tribute to our home province and its people, focusing on two of the province’s richest and most distinct cultural treasures: its dialects and its folksongs. We toured the island recording interviews with residents of various regions in 2015, with the aim of using these interviews as source material for a new composition. The interviews provide a snapshot in time of the diversity of spoken English in Newfoundland and Labrador. Dialects in the province are strikingly different from those of mainland North America, largely because of the historical isolation of its many coastal communities. For hundreds of years, those communities had only marine access to the outside world and as such became crucibles for independent dialectal evolution, resulting in the many distinct speech patterns that can be heard in various parts of the province today. 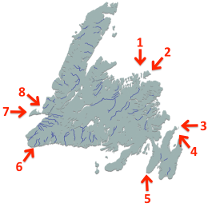 Remnants of the speech of the original settlers from England, Ireland, Scotland, and France can still be heard in various Newfoundland dialects today, along with various unique characteristics that developed over time. However, due in part to changing economic and demographic conditions, the influence of mass media, and easier travel, many features of those dialects are currently declining. We therefore conduct this project at a historically important moment, while the richness and breadth of speech patterns in the province are still living realities. Like its dialectal heritage, the folksong tradition of Newfoundland and Labrador is directly influenced by the traditions of European countries. While Newfoundland and Labrador folksongs are in many ways stylistically similar to the songs imported by the original settlers, a canon of songs written in and about the province has become a cornerstone of its cultural identity. Most residents of the province are not only familiar with traditional Newfoundland and Labrador music but feel a deep connection to it. For this reason, we decided to use Newfoundland folk music as the subject matter for most of our interviews. People took very kindly to this and shared many touching stories about the role music plays in their lives. Some even volunteered to sing folksongs for us, and in every case the songs they sang were ones we had not previously known. In all, we collected over 18 hours of interviews with 20 individuals. We are currently in the process of analyzing and cataloguing this material for its phonetic features as well as its semantic content. When that long task is complete, we will create a piece for solo guitar and electronics, using clips from the interviews in various ways. At times this will involve straightforward sampling, but we will also employ more advanced electroacoustic techniques such as formant modeling, convolution, and concatenative synthesis. The goal is to highlight the inherent musicality of Newfoundland and Labrador dialects, while at the same time recounting the stories and values of the people of the province. The guitar, an instrument with deep roots in both folk and classical traditions, provides an ideal bridge between the culture that has inspired us and the university setting in which we are working. We seek to create a piece that is both innovative in its application of new technological means and compositional methods, while remaining accessible and meaningful for both the people who inspired our project and for our academic and musical peers. In this photo: Schulich School of Music graduate students Jason Noble and Steve Cowan.